The recent papers on TRIM5-cyclophilin fusion proteins as retroviral restriction systems,1 and my nattering about myxomavirus the other day, reminded me of another paper I recently read. TRIM5 is one of a family of proteins that prevent replication of certain retroviruses; the TRIM5-CYP fusion protein protects against infection so that, for example, feline immunodeficiency virus doesn’t effectively infect rhesus macaque cells. This is a specific instance of a general problem: Why are are some viruses only able to infect certain species, while others leap around between species like the chamois of the alps? This isn’t just relevant to retroviruses. Emerging virus infections are an ongoing problem, and lots of the emerging viruses are jumping into humans from some other species — HIV, Ebola, and SARS being particularly obvious examples out of many. In many cases, of course, viruses are specifically adapted to their receptors, and another species may not have the precise receptor, or the precise shape or sequence the virus needs to get in a cell in the first place. Similarly, the virus may depend on some species-specific structure for some step in replication. But there are viruses that can cheerfully replicate in insects, birds, and mammals; fundamental replication equipment is pretty conserved. In other cases — like the TRIM5 story — hosts may have evolved systems to restrict viruses, and only those viruses that were resistant, or that developed resistance, to the restriction systems were able to persist. In this case, host restriction is the flip side of viral immune evasion;2 viruses that are unable to counteract the host’s immune adaptations go extinct in that host. Most such extinctions are invisible; species-specific viruses are (at least in some cases) the fossil evidence for ancient viruses. Beta-herpesviruses — cytomegaloviruses, for example — are among the most species-specific virus families. (I’m approaching my point here.) Broadly speaking, the way you get a new beta-herpesvirus is when its host speciates. (The same is generally true for other herpesvirus families, but there’s more evidence for cross-species jumping of some of the other families.) How come? What is it that’s restricting mouse cytomegalovirus (MCMV) to mice, and prevents them from infecting humans? The answer was a bit of a surprise to me, actually: Apoptosis is a major factor. If you’d asked me a couple of years ago, I’d have guess that MCMV would simply never get in to human cells — wrong receptor, I’d have suggested. I would have been wrong.3 Jurak and Brune (and here I have reached my point) showed a couple of years ago that MCMV gets into human cells just fine, 4 but in most cases it’s not able to do anything afterward; it doesn’t spread to neighboring cells, and eventually it just fades away from the culture. The exceptions, as is often the case, were interesting. In two of the cell lines they tested, MCMV not only entered, but replicated and spread (though a thousand times less well than in permissive mouse cells). Those cell lines are 293 and 911 cells, and right now the virologists5 in my audience5 are nodding and saying, “Aha!” — because 293 and 911 cells have something in common: They both contain chunks of a human adenovirus genome.6 There are a bunch of functions included in those chunks of genomes, but to cut to the chase, it was the anti-apoptosis function that proved to be important here. Human cells infected with MCMV undergo apoptosis, dying before the virus can replicate. Swapping various anti-apoptotic genes into human cells renders them sensitive to MCMV infection. Blocking apoptosis is a very common, if not universal, function of viruses, so clearly apoptosis is a hugely important antiviral process. Paradoxically, that’s why I was surprised to find out that apoptosis limited MCMV replication in human cells. The apoptosis pathway is pretty conserved, and most of the viral anti-apoptotic molecules I could name off the top of my head7,8 act on many species. (The baculovirus protein IAP (“Inhibitor of APoptosis”) — evolved to function in cells of infected insects — works just fine in mammalian cells,9 for example.) It’s not at all clear to me why MCMV, which can presumably inhibit apoptosis in mouse cells, can’t do so in human cells. Human CMV does block apoptosis in human cells, through more than one pathway, and swapping the HCMV gene into MCMV makes the mouse virus able to replicate in human cells. Presumably the MCMV gene(s) that have the similar function are tuned to the mouse version of the apoptosis pathway. I don’t want to leave the impression that apoptosis is the usual reason for host restriction. There are all kinds of other explanations. TRIM family proteins, as I said, limit retroviruses, as do APOBEC family proteins; SARS adapted to humans by (among other things) mutating its receptor to bind better to human angiotensin-converting enzyme 2; 11 myxomavirus are apparently restricted to some species because their immune response modifiers are species-specific12 (and I will probably talk more about that some time); and so on. Nice pics. What the hell are they…? 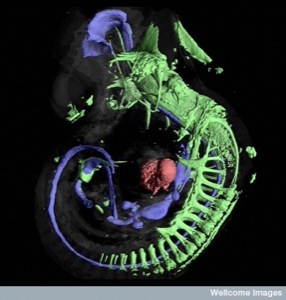 What’s with the embryo? The pics are all from Wellcome Images, their open-source image library. I don’t know how to make a direct link to the individual images, unfortunately; you can usually mouseover my images for more detail, depending on whether I remember to add the info in the first place. The first is ID L0039480: “Huitu zhenjiu yixue (Illustrated Acupuncture Made Easy), by Li Shouxian, was composed in 1798 (3rd year of the Jiaqing reign period of the Qing dynasty). It comprises two volumes (juan), plus a supplementary volume containing illustrations of the ‘Seventy-two fan’. 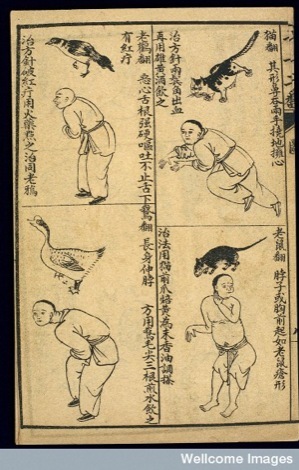 … This illustration shows the manifestations of Cat fan, Stork fan, Rat/mouse fan and Goose fan.” I wanted a picture of multiple animals in contact with a human, and this was perfect. 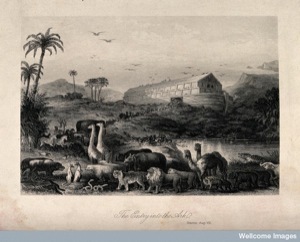 The 3rd is Noah’s Ark; it’s linked to http://catalogue.wellcome.ac.uk/record=b1164265 but the artist is not credited. I’ve been interested in, but baffled by, apoptosis for a long time, ever since my PhD qualifier many years ago, when apoptosis was one of my subjects (and the examiner and I spent the discussion politely but emphatically pronouncing [him] or not pronouncing [me] the second “p”; followed by a brief but intense discussion of the propoer pronunciation in New vs. Old Greek). I once had the theory that viral multi-species apoptosis evasion proteins are typically hijacked forms of host apoptosis regulators. Examples include the IAPs the vFLIPs and CRMB (how would I fare at the next cocktail party?) As the endogenous forms are closely related in mammals, and occasionally even in other lineages, hijacking these factors gives the virus a tool with broad applicability. By contrast, at least some of the species specific inhibitors appear to hve been ‘invented’ by the virus, or at least adapted from a sequence stretch that originally something very different. Proteins of this class lack the evolutionary history that leads to multi-species inhibition, and thus have a higher likelihood to be specific for one species only. I am no longer sure how good this theory really is, though. The Myxoma M-T5 protein you mentioned does not fit particularly well. This class of proteins clearly does have an evolutionary history. I guess that in this case the crucial factor is peptide recognition vs. protein/domain recognition.